Guy Damien 'The Flower' / 'Le Démon Blond' Lafleur (born September 20, 1951) is a former Canadian professional ice hockey player who is widely regarded as one of the most naturally gifted and popular players ever to play professional ice hockey. 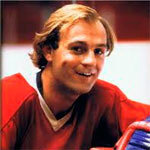 At first, Guy Lafleur struggled to live up to expectations in the league, but by 1974 had developed his trademark smooth skating style and scoring touch. He was a cornerstone of five Stanley Cup championship teams. He was one of the most popular players on a very popular team; fans chanted 'Guy, Guy, Guy!' whenever he touched the puck. He became known among English fans as 'Flower', while among French fans he was dubbed 'le Démon Blond' (the Blonde Demon). After being inducted into the Hockey Hall of Fame, Lafleur returned to the NHL briefly from 1988–89 through 1990–91 with the New York Rangers and the Quebec Nordiques. Lafleur remained one of the few players that did not wear protective helmets.